There are a few names in the industry that instantly come to mind when we speak about top-shelf vodka and Van Gogh is one of them. It is a distillery not only known for a classic and smooth clear vodka, a nice and botanical gin but what has amounted to a total of 15 flavored vodkas with the 2009 release of the luscious Dutch Caramel. Van Gogh Vodka started in 1997 as Luctor International with a single gin called Leyden and within two years it was replaced by Van Gogh Gin. This gin is based on a recipe found at the Schiedam distillery and is smooth like many of the newer generations of gins are, but clearly has those classical stylings found in dry Dutch gins. It wasn't until 2000 that Van Gogh released a vodka and, eventually, flavored vodkas. In 2008 the company changed its name to Van Gogh Imports. Van Gogh Vodka boasts more 4- and 5-star rated vodkas than any other company and considers itself the leader of the flavored vodka movement. Their innovation and dedication to quality has never ceased and, while the clear vodka is a staple for many, 80% of the business is made up of flavors. Today Van Gogh is sold in 37 countries with the U.S. being the most popular market. A flavor that is hot in one part of the world may lose out to another somewhere else. Norman Bonchick says that this comparison can even be found throughout the United States. When it comes to the professional bartender, Bonchick says that the most popular "depends on the area of US. The East is a bigger flavor market than the Central and certainly more than the West" and explains that on the west coast bartenders are more inclined to make their own infusions. The home market is a different story. Part of the Van Gogh philosophy behind flavored vodkas is to aid the novice in impressing guests with little effort. Bonchick explains: "take a colored, flavored vodka, shake it up, pour it and you look like a genius, a mixologist." Small batch flavored and clear vodkas and a gin, averaging 80 proof (40% alcohol/volume) Flavors are double infused. The following continues my 2009 interview with Van Gogh Vodka CEO, Norman Bonchick. Success is not always found on the first try, however. If you remember the pomegranate craze of a few years ago you will remember the influx of pomegranate vodkas that hit the market. When Van Gogh got a hold of the idea they rushed development and released the spirit. Not totally satisfied with the results (though they were astounding), the Master Distiller went back and perfected it, removing some sweetness and adding the fruit's natural bitter qualities. Sometimes opportunity knocks and when the only vodka company producing a caramel infused vodka went out of business recently Van Gogh saw an opportunity and after tasting the discontinued vodka, Bonchick says "We knew we could do better." The result is a deep brown colored vodka that simply melts in your mouth and has been described as "the most romantic alcohol." The success of the 2008 release of Van Gogh Espresso and Double Espresso vodkas has yet another story. This one comes from the fact that coffee is the most consumed drink in the world, just behind water. Naturally, the Van Gogh team wanted to capitalize on this and Bonchick points out that it is a success and while some flavors may be cyclical, "espressos will be around forever." One aspect of Van Gogh's flavored vodkas that I admire is how close they really do come to the real flavor. Many times when fruits, sweets or other flavors meet alcohol there is a considerable loss in the true flavor, but this is not the case for Van Gogh's vodkas. When you taste their banana you get the taste of an actual banana, with their espressos you feel like you are sitting in the local coffee shop and sipping a freshly brewed cup and when drinking their apple vodka I am transported to an orchard filled with fresh fruit. Van Gogh strives to bring together natural taste and aroma and I have yet to taste one of the vodkas that have missed that mark, although the Mojito Mint is not really my style. 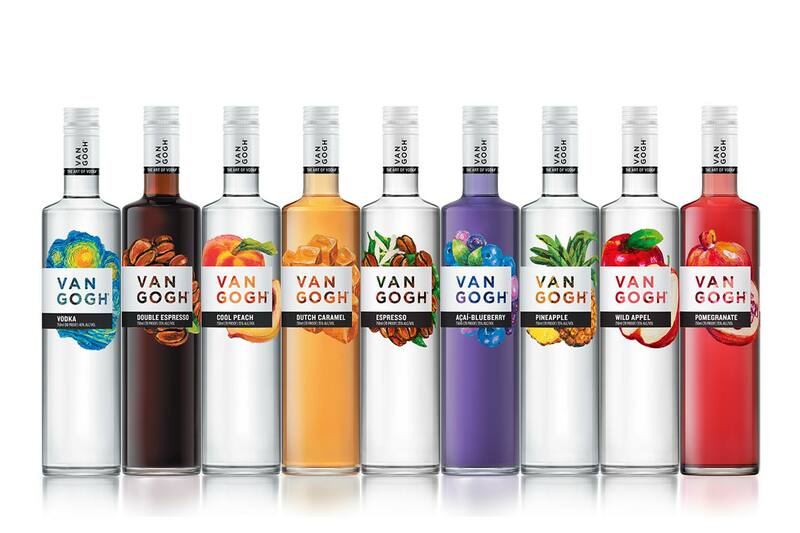 Van Gogh takes the flavor comparison so seriously that they have established a taste test to ensure that their vodkas are as close to the intended flavors as possible and employed a taste test to check the accuracy of their flavors. Bonchick told me that this process involves a sip of a straight vodka, one of it chilled, then a bite of the flavor "standard" (i.e. a banana). Van Gogh Vodka has a wide array of options available for creating unique and great tasting cocktails. Their portfolio includes quality clear vodkas and a vast array of flavors, from fun fruits to sweet treats. When we speak about distilled spirits, desserts are often reserved for liqueurs, but in an amazing twist, Van Gogh Vodka has released a flavored vodka that defies this convention. The vodka is Dutch Caramel and with its 2009 release, it has increased the vodka company's list of infused vodkas to 19. While most of those are fruits, it is the Dutch interpretation of chocolate and, now, caramel, that bring sweet to vodkas. This caramel vodka from Van Gogh is nothing short of delicious. It is almost addicting and were it not for it also being intoxicating, it would be a treat that anyone of any age could fall in love with. One of the best ways to enjoy Van Gogh Dutch Caramel is well-chilled and I suggest keeping the bottle in the freezer, or at least the refrigerator. This gives you the option of a quick, cold sipper if poured straight into a glass, or to mix it up in what could be an endless list of delicious cocktails like a Caramel Latte, Proost or the ever-indulgent Snickertini. Van Gogh Vodka continues to produce some of the best flavored vodkas available. The good news is that Van Gogh is a popular brand and one that can be found almost anywhere. The great news is that they have recently released a vodka with the elusive blueberry. I put blueberry in alcohol in the same category as cherry, lemon, and grape. It is with these particular fruit flavors that the taste of the vodka (or other spirit) can easily go medicinal and become reminiscent of cough syrups. Yet, Van Gogh has struck gold with the Acai-Blueberry - or maybe they struck blue. I was very hesitant to taste Van Gogh Acai-Blueberry because, although I love flavored vodkas and have been impressed with the distiller's results to date, it was still blueberry. Previous experience has influenced my perception of blueberry in alcohol but I worked that out and with the first sip I knew this blueberry vodka was a winner. Straight up, chilled, and mixed, Van Gogh Acai-Blueberry has found a place in my liquor cabinet and I believe the natural flavoring (as opposed to the artificial often employed) makes the difference. The taste of this vodka is excellent, but I also am in love with the deep purple-blue color of the spirit and the possibility that it brings to the rainbow of drinks we can make. So you have real acai-blueberry flavors with a stunning hue and the drink possibilities open up. Also, there is the Very Berry Cosmo, which blows the Cosmopolitan out of the water, and the Twisted Berry. The point is that blueberry lovers can now rejoice! The nose opens with natural blueberries, just like those beauties in the produce section, with a sweetness that is entrapping. The palate has Van Gogh's signature oil and a touch of alcohol that is perfectly covered by the sweet acai. It finishes clean with a full, quick blueberry that is simply delightful. Neutral grain vodka infused with acai blueberry. Distilled in Schiedam, Holland by Royal Dirkzwager Distilleries. In the not too distant past, Van Gogh Vodka followed a trend in flavored vodka that melds our caffeinated desires with liquor. This came about with the release of their Espresso and Double Espresso vodkas, each infused naturally with the rich flavors of lush coffee. Both are great additions to the bar and will give you that shot of caffeine you may be looking for in your drinks. The other aspect of these newer flavors that is most impressive is that they hold the Van Gogh quality that we've come to expect and that reputation has yet to be sullied no matter what flavored vodka they take on. I prefer, by far, the light sweetness and coffee bean of the single over the double because it is subtle and delicious without being overbearing. The Double Espresso is still a fantastic vodka, but I've noticed that those extra shots do the same in vodka as they do in the java house: the mix gets thick, the caffeine hits like a brick wall, and it teeters the fine line between syrup and thick drink. With the Espresso, cocktails are lighter, both in color and taste. It is the ideal substitute for the vodka and Kahlua found in the more common Espresso Martinis. This also makes a fantastic White (or Black) Russian, a delicious Talking Monkey. I had a bit of fun pairing it with pomegranate juice for my Pomspresso Martini and with gin for my Ginspresso Martini. Back to the Double Espresso... It is a powerful one, but not as much as Three Olives Triple Espresso. It is a great substitute for Kahlua in most of the common coffee-flavored drinks, like the Bacchus Espresso Martini, because it is dark and rich with just a touch more caffeine. It is also fun for shots like Van Gogh's Irish Coffee Drop. The fragrance is light and airy, reminiscent of a small coffee shop with fresh, dark beans percolating. The palate is that of velvet, and dark roasted beans caress the tongue. The finish has a strong, lasting note of a mocha latte made with rich chocolate and cream. This vodka has a significantly richer aroma that is marked with sweet, dark cocoa which fills the air. Not quite a light syrup, the Double Espresso is thicker, darker feeling and has a chocolate-caramel tone. The finish is rich in cocoa and has a caffeinated kick to it that is an eye opener, but a gentle one. The October 2006 release of their Pomegranate Vodka has ran the total of Van Gogh's flavored vodkas up to fifteen (besides the clear vodka). That's a rich line-up for a small batch producer and this feat is sure to put Van Gogh at the top of innovation, quality and diversity in the spirits world. As one of the "trendy" flavors of the time, pomegranate is a tempting mistress for distillers and few of those that have attempted have gotten it right. Van Gogh is one of those companies that hit the nail with this bottling. A sweet, sultry spirit can be found inside the beautifully designed bottle of Van Gogh Pomegranate Vodka that is adorned with the namesake's art work. Tasting this flavor-infused vodka is like taking an exotic journey from light sweetness to a darkly delectable explosion of real fruit. It all begins with a sweet sensory experience filled with the aroma of melon, pomegranate and berries and the visual beauty of a deep crimson that lures one in to the taste that awaits. At first, a wave of Van Gogh's clear vodka splashes through as the flavor eases in on the palate in spirally peaks of sweet and oaky pomegranate. The smooth flavor ripples are not interrupted, but enhanced by a strong citrus kick and delightfully dark flavors remain for minutes, seductively leading to the the next sip. Van Gogh's Pomegranate Vodka is a wonderful sipper, either chilled, served straight, or on the rocks but it is also has numerous mixing possibilities. It was the missing ingredient in my task to create the Red Ball and paired wonderfully with X-Rated Fusion Liqueur in the simply sweet, yet complex Pom-X Martini. The wonders of the vodka are not lost in the Peach Pomegranate Holiday Martini, the Pomegranate-Pineapple Fireworks, or the Communitini. Imported from Royal Dirkzwager Distilleries in Schiedam, Holland. Distilled from grain with a unique double fresh fruit infusion.